We use the latest test equipment and software to produce a fully computerised report for you. We are then able to provide circuit charts, installation board details, observations and recommendations by category. The ELECTRICITY AT WORK REGULATIONS (EAW) came into force in 1989. These regulations place legal onus on every employer where Portable Electrical Appliances are used to ensure they are in a safe working order, to prevent injury or death. The employee also has a responsibility placed on him or her to visually inspect and use the appliance in a safe manner. Portable Electrical Appliances are interpreted as any item which plugs into a socket, covering such items as kettles, white goods, vacuum cleaners, power tools through to business machines such as computers, facsimile machines, etc. Three phase and fixed electrical machinery also have to comply with these important safety regulations. The guidelines stating the frequency of testing we use are those issued by the EEA and IEE which are stricter than those of the Health & Safety Executive. Frequency of testing varies considerably due to the differing environments and the amount of use of the particular appliance. The onus however is on the ‘DUTY HOLDER’ to ensure that the tests are carried out at the correct frequency. We will make recommendations for you based on the above to satisfy the demands of the regulations. All appliances must be regularly maintained by inspection and or testing and, in order to prove this has been carried out, full records are recommended to be kept. Our records are fully computerised and kept in our main computer database. If there should be an accident with an appliance that has not been maintained, inspected and or tested according to these Regulations, it could mean considerable trauma for the person injured and the person responsible for Health and Safety implementation. It may also cause problems with an insurance claim. The service we offer is a professional management of inspection, testing and certification of all your appliances. We are equipped with the latest high-tech computerised testing equipment which exceeds tests recommended by the Regulations. Testing can be carried out on 110v, 240v and 415v portable appliances and machinery. Separate test equipment for extension leads, sockets and fuses, etc, are part of our standard equipment. A mutually convenient date can be arranged to visit your premises and test all your appliances. On completion of the inspection and testing, any failures will be notified to you verbally and a report printed and sent to you in order that you can make any necessary repair arrangements. Our first test on the appliance is a visual inspection of the plug, wiring, fuse rating, condition of lead, etc. We often find the plug on the appliance to be fitted with a fuse of incorrect rating, and these will be changed to eradicate any danger this poses. Our test equipment then carries out up to six further electrical tests, if required. Each test is clearly visible pass or fail on the LCD read-out. No further testing procedure is possible if an appliance has failed any test. If a fail label is issued, this appliance must not be used until it has been repaired and retested. Each appliance is labelled with pass or fail, together with the date of the retest. A bound ‘Portable Appliance Test Report’ is issued showing details of each piece of equipment (serial numbers, model numbers, etc) together with readings taken, for possible inspection by safety inspectors. Any minor repairs, e.g. incorrectly wired plugs, etc, will be carried out at the time of testing to ensure each appliance passes all relevant tests. For any appliance which fails testing, we shall of course be only too pleased to arrange the repair of these for you and they will be returned to a fully tested condition. In most circumstances however, the manufacturer or their agents are usually the best equipped to carry out any specialist repairs. Any such repairs carried out should be tested afterwards by the repairers, and your fail certificate only needs to be signed by them to this effect. It is essential if you employ sub-contractors (classed as employees whilst on your premises) that any equipment they bring to your premises has also been tested. If you have any employees who have brought their own electrical appliances to your premises, such as fan heaters, personnel radios, etc, these also need testing or removing from your premises. Advanced Electrical Contractors will provide fully trained PAT Testing Engineers who are friendly and well presented, offering minimal disruption to the day to day running of your organisation during testing. Fixed Installation Testing or Periodic Inspection and Testing, as it is often referred to, is a report on the electrical wiring of a property, outlining any defects it may have that may prove to be a safety hazard. Owners of buildings have a duty of care to users. The wiring of buildings is an area that is often taken for granted, yet it can be a major cause of fire or injury through electric shocks. Why carry out fixed installation testing? The requirements for fixed installation testing are contained within the “Institution of Electrical Engineers 17th Edition, Wiring Regulations (BS 7671)”. Depending upon the type of establishment, the frequency of inspection and testing will vary. 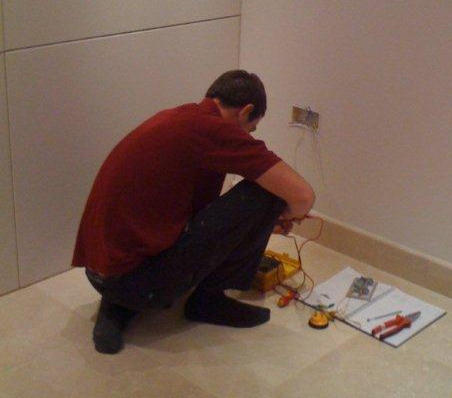 However, all electrical installations require testing to meet the requirements of the IEE Wiring Regulations. Advanced Electrical Contractors employ qualified electricians to carry out all electrical testing work to the highest standard whilst providing the most competitive prices to our clients. We treat each client as an individual, therefore, tailoring each testing program to the needs of each customer. When testing is being carried out, there is a requirement for parts of the installation to be isolated for periods of time, therefore we offer out of hours testing and will work with the client to perform necessary tasks during shutdown periods. We will provide your company or organisation with a comprehensive report accredited by the NICEIC within 14 days of completion of testing. If there are any faults reported, these are categorised with a rating of 1 to 4, depending on the severity of the fault found, with a 1 being a fault found that is in need of urgent attention, and 4 being an observation that does not comply with current regulations for a fixed installation and requires some remedial action. We welcome your call to discuss the above or any systems or appliances that need testing and inspecting. Please contact us now to discuss your home or business requirements. For a free, no obligation quotation, click here to send us an email, or call us today on either of the phone numbers below.